On Thursday, Jan. 22 Russian Foreign Minister Sergei Lavrov dismissed attempts to toy with national sentiment in the context of the Auschwitz liberation anniversary as "blasphemous and cynical" in response to the Polish Foreign Minister's remarks. "I cannot even comment on this,” Lavrov told reporters in Berlin. “It was the Red Army that liberated Auschwitz. It [the Red Army] included Russians, Ukrainians, Chechens, Tatars, Georgians, etc. It is absolutely blasphemous and cynical to try to toy with national sentiments in this situation." Head of the EU Delegation to Russia Vygaudas Usackas refrained from commenting on the Polish Foreign Minister's statements. "You've caught me off guard on the question,” Usackas said at a press conference at the Interfax main office on Thursday, Jan 22. “I don't know which battalion or brigade exactly liberated Auschwitz. There were a lot of people there, it was World War II. As far as I know, these were Soviet soldiers, and they were of different ethnicities, such as Russians, Ukrainians, Belarusians, perhaps Lithuanians. I wouldn't like to devote our press conference to what the Polish foreign minister said." The prisoners of the Auschwitz Nazi Germany concentration camp based in Poland were liberated by Soviet troops on January 27, 1945, a day now commemorated as International Holocaust Remembrance Day. 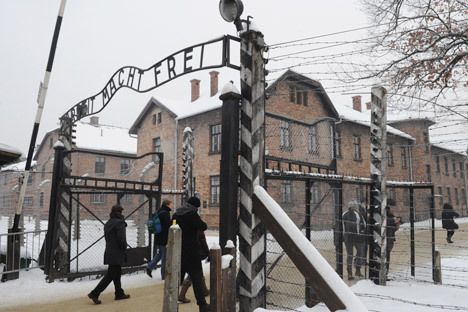 This year marks the 70th anniversary of the liberation of Auschwitz.